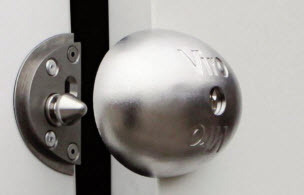 The Viro Van Lock can be practically installed in any situation as it tolerates orrecovers (with spacers) any door misalignments, it presses closed easily and provides a high degree of security thanks to the fixing system – the 7 pin key and the drill-resistant plate. 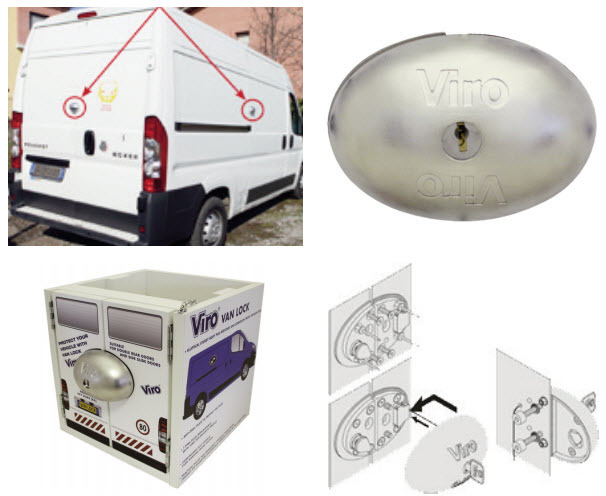 The special (patented) shape, without sharp edges or gripping points, together with the sturdy and corrosion-proof inox stainless steel, distinguish this innovative locking system for trucks and vans, which can be applied to rear wing or side sliding doors or both. The spring-loaded, casehardened, tempered and galvanized steel dead bolt locks automatically (without using the key) by pushing the second door against the first or closing the side sliding door. The Van Lock can be kept in ‘always open’ mode with the key inserted and fully turned. An added safety device allows for emergency unlocking from the inside (practically impossible to grip from the outside with burglary tools) if the operator is accidentally locked in. Supplied with 3 Viro Top Security profile nickel-plated brass keys, easy to grip (even when wearing gloves), inox stainless steel screws, bolts, washers and rivets; adhesive drilling template; inox stainless steel spacers (which can be ordered individually) to compensate any misalignments between the doors; and nonscratch rubber seal. A working display model is available and is a great way for potential customers to see the quality of the Van Lock and see how simple it is to operate. The free working model, usually worth £95, is available to all customers that buy 5 or more units in a single order. In addition to the Viro Van lock, SKS are also Viro UK’s official distributor and stock majority of Viro’s range of high quality and durable products.